See the future through the vision of the Wireless World Research Forum. 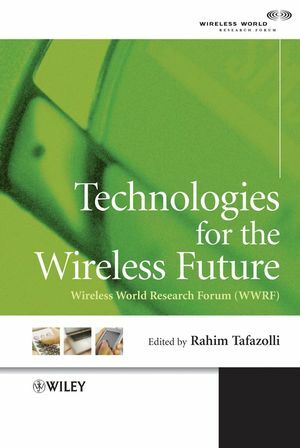 Technologies for the Wireless Future, the result of pioneering cooperative work of many academic and industrial researchers from WWRF, provides a wide picture of the research challenges for the future wireless world. 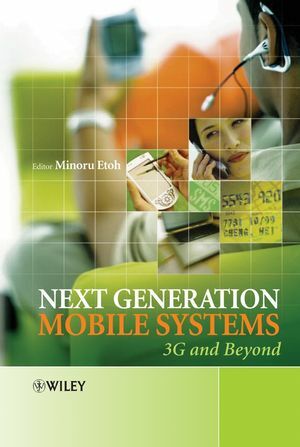 Despite much emphasis on hard technology, the user is certainly not forgotten as this book provides an all-encompassing treatment of future wireless technologies ranging from user centred design processes and I-centric communications to end-to-end econfigurability and short-range wireless networks. The content will have a wide-ranging appeal to engineers, researchers, managers and students with interest on future of wireless. He is the Head of Mobile Communications Research Group in CCSR, School of Electronics and Physical Sciences, the University of Surrey, England. His research activities are on optimization techniques for mobile multimedia networks, mainly on advance Resource management, Mobility management and Media Access Control. He has published more than 300 research papers in refereed journals, international conferences and as invited speaker. He currently has more than 15 patents in the field of mobile communications. He is the founder and the past Chairman of International Conference on "3G Mobile Technologies". He is also member of IEE Committee on the UK Regulations on "Information Technology & Telecommunications", a member of the WWRF Vision Committee, and past Chairman of "New Technologies" group of Wireless World Research Forum (WWRF), and academic co-ordinator of the UK Mobile VCE (Virtual Centre of Excellence). 1. Introduction Edited by Mikko Uusitalo and Sudhir Dixit (Nokia). 1.1 Goals and Objectives . 1.3 Vision of the Wireless World. 1.4 The International Context and 4G Activities. 1.5 Working Groups of the WWRF. 2. A User-Centred Approach to the Wireless World Edited by Ken Crisler (Motorola). 2.1 UCD Processes for Wireless World Research. 2.2 A User-Focused Reference Model for Wireless Systems Beyond 3G. 2.3 The Use of Scenarios for the Wireless World. 2.4 User Interface Technologies and Techniques. 3. Service Infrastructures Edited by Radu Popescu-Zeletin and Stefan Arbanowski (Fraunhofer FOKUS). 3.1 I-centric Communications – Basic Terminology. 3.2 Business Models in the Future Wireless World. 3.3 Personalization for the Future Wireless World. 3.4 Ambient Awareness in Wireless Information and Communication Services. 3.5 Generic Service Elements for Adaptive Applications. 4. Cooperation Between Networks Edited by Rahim Tafazolli, Klaus Moessner Christos Politis (The University of Surrey, UK) and Tasos Dagiuklas (University of Aegean, Greece). 4.1 CoNet Vision and Roadmap. 4.2 Cooperative Network Research Challenges. 4.4 Network Component Technologies for Cooperative Networks. 5.1 Reconfigurable Systems and Reference Models. 5.2 RF/IF Architectures for Software-defined Radios. 5.4 Reconfiguration Management and Interfaces. 6. Technologies to Improve Spectrum Efficiency Edited by Bernhard Walke and Ralf Pabst (Aachen University, ComNets). 6.2 Relay-based Deployment Concepts for Wireless and Mobile Broadband Cellular Radio. 6.3 Spectrum for Future Mobile and Wireless Communications. 7. New Air Interface Technologies Edited by Bernhard Walke and Ralf Pabst (Aachen University, ComNets). 7.1 Broadband MultiCarrier-based Air Interface for Future Mobile Radio Systems. 7.2 A Mixed OFDM/Single Carrier Air Interface. 7.3 Smart Antennas and Related Technologies. 8. Scenarios for the Future Wireless Market Edited by Ross Pow (Analysys) and Klaus Moessner (The University of Surrey). 8.1 Current Status and Prediction for Evolution of the Wireless Market. 8.2 The Wireless World of the ‘Blue’ Scenario. 8.3 The Wireless World of the ‘Red’ Scenario. 8.4 The Wireless World of the ‘Green’ Scenario. 9. Reference Model and Technology Roadmap Edited by Andreas Schieder (Ericsson).